Jurgen Klopp with Jose Mourinho after the defeat. AS Manchester United turned to established superstars to ignite its attack, young striker Marcus Rashford was in danger of becoming a forgotten man at Old Trafford. He reminded the world of his talent on Saturday. Making his first start of 2018 in possibly the biggest match in English football, Rashford scored two goals in the first 24 minutes to set United on its way to a 2-1 win over fierce rival Liverpool at Old Trafford. "The last few months it was not happening for him and he was feeling it a bit in terms of confidence," United manager Jose Mourinho said. 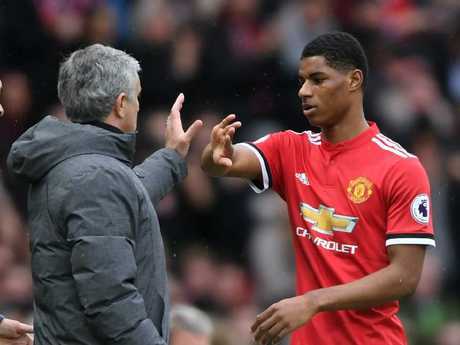 Since Mourinho took charge of United, Rashford has seen his chances of establishing himself as the team's main striker disappear following the signings of Zlatan Ibrahimovic and, last summer, Romelu Lukaku. Then, in January, Mourinho opportunistically brought in Chile forward Alexis Sanchez, putting another obstacle in the 20-year-old Rashford's path to the first team. This was Rashford's first league start since Dec. 26, since when he has had to make do with cameos off the bench. His inactivity potentially threatened his spot in England's squad for the World Cup but his goals against Liverpool brought him back into the spotlight. It was his first Premier League double since his league debut, in February 2016 against Arsenal, when he burst onto the scene after being plucked from the under-19 squad by then-manager Louis van Gaal because of an injury crisis in United's attack. In what was always going to be a clash of styles at Old Trafford, United's tactics were hardly sophisticated - defend deeply and in numbers, and hit Liverpool with the long ball. They worked perfectly, at least in the first half. Liverpool centre back Dejan Lovren was bullied by Romelu Lukaku, experiencing the kind of game he endured against Tottenham in October when he was embarrassingly substituted after 31 minutes. Both of United's goals came from Lovren being knocked off balance by Lukaku after long clearances by goalkeeper David De Gea, and Rashford took full advantage. 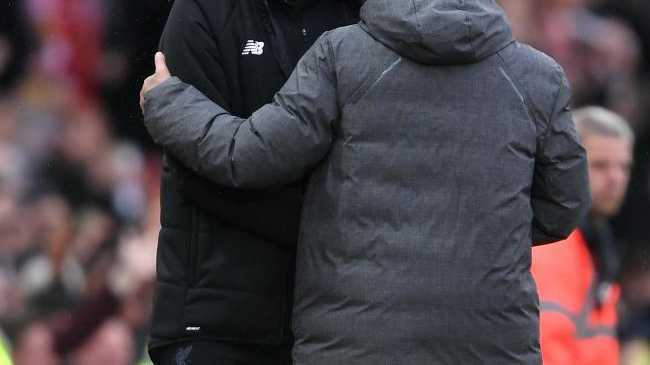 Liverpool's German manager Jurgen Klopp (3R) greets Man U playes. For the first, Lukaku held his ground as Lovren bounced off him, and flicked a header onto Rashford. The England striker cut inside right back Trent Alexander- Arnold and fizzed in a low shot that gave goalkeeper Loris Karius no chance. For the second, Lovren actually got his head to the ball off De Gea's kick but stumbled to the ground under pressure from Lukaku, who collected possession and fed Juan Mata. Virgil van Dijk made an interception, but Rashford pounced on the loose ball to send in a shot that took a minor deflection off Alexander-Arnold's heel and span into the same corner. 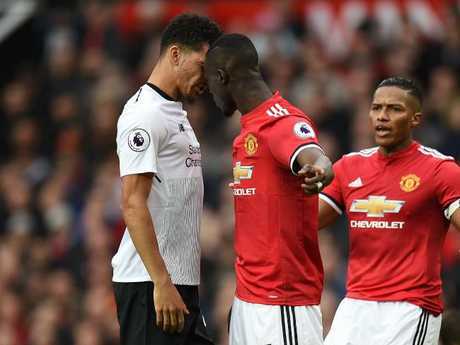 Lackluster in the first half, Liverpool improved and, as United retreated further, reduced the deficit through Eric Bailly 66th-minute own-goal off Sadio Mane's cross. They couldn't manage an equalizer, however, on a day its prolific strikeforce was kept quiet. 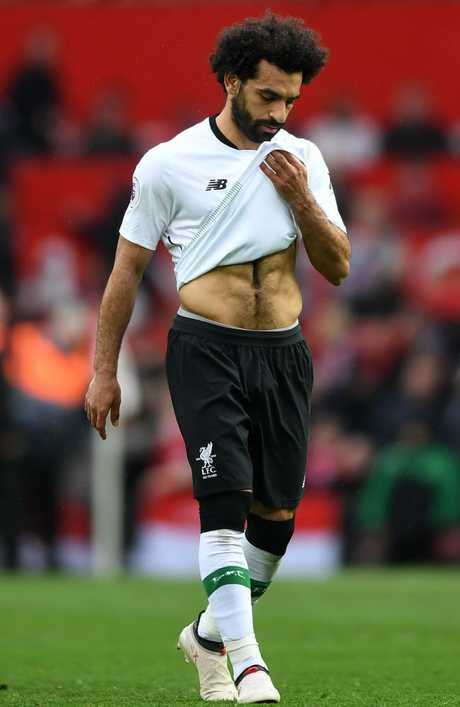 Mohamed Salah, the league's joint-top scorer, was fairly anonymous for Liverpool, which lost for only the second time in 21 league games and slipped five points behind United in the race for second place behind Manchester City. Mohamed Salah of Liverpool - a rare quiet game. "It wasn't their style that won and our style that lost," Liverpool manager Juergen Klopp said. "There were two situations (for the United goals) that had absolutely nothing to do with style." 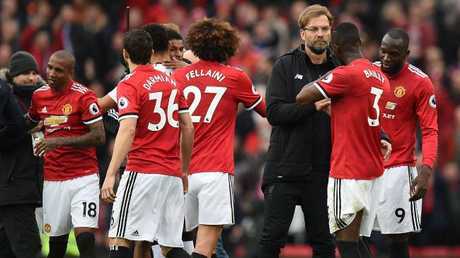 And Klopp raged at the decision not to award his side a penalty when Sadio Mane tumbled under a challenge from Marouane Felliani as Klopp's men saw three penalty appeals in all waved away. "Second half we had to continue chasing the game, then we scored the goal and should have been a penalty around Felliani situation on Sadio," said Klopp. "It was best piece of football in the whole game." And Klopp claimed his job would have been made "massively" easier had penalty decisions gone in his side's favour in recent weeks after conceding a stoppage time spot-kick to draw 2-2 with Tottenham last month. "If the assistant against Tottenham didn't see, which can happen, we win 2-1 against Tottenham, and today if he would see it then it's a draw. 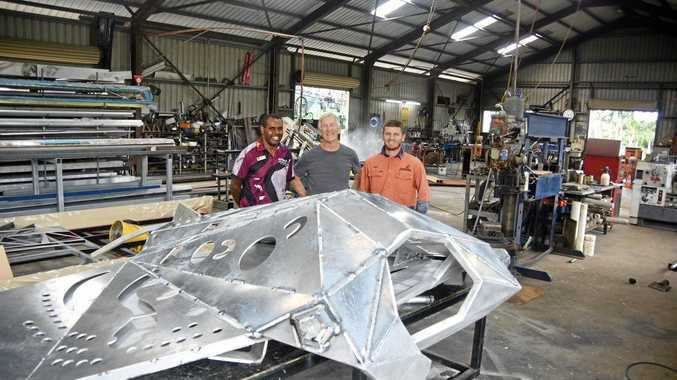 "We can count how many points that would be more and it would change my life massively." 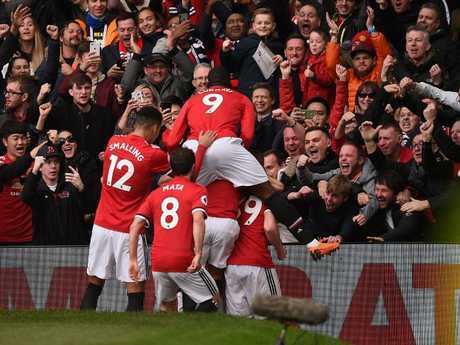 Having also beaten Chelsea 2-1 at Old Trafford two weeks ago, United looks increasingly assured of a Champions League qualifying spot through a top-four finish "Perfect result, yes," said Mourinho. "Perfect performance, I wouldn't go so far. Perfect in relation to what the game gave us."